All about fishing for northern pike in Alaska. This state offers unique fishing opportunities. Listed below find information about choices for catching northerns in Alaska waters. Pike in the 20-pound range are common in many Alaskan rivers and lakes. 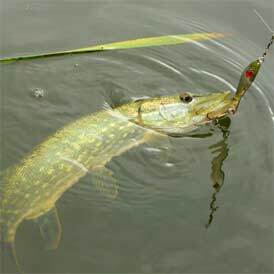 Although, northern pike can often grow much larger. The state sport fishing record is 38 pounds, caught from the Yukon River. Lakes with known populations of northerns include Alexander Lake, Rabbit Lake, Flathorn Lake, Lockwood Lake, Witsoe Lake, Pear Lake, Whiskey Lake, Seven Mile Lake, Rocky Lake, Sawmill Lake, Bains Ponds, Chicken Lake, Echo Ponds, Little Frazer Lake, Red Shirt Lake, Birch Creek, Donkey Creek, Eightmile Creek, Johnson Creek, Skwentna River, Witsoe Creek, Fish Creek, Swan Lake, Chuitbunga Lake, Crystal Lake, Wasilla Lake, Campbell Creek, Upper Fire Lake, Hall Lake, Union Lake and many other lakes, rivers, ponds and creeks. By clicking on the image or link above, you will be taken to a page offering more information about northern pike. Many of the species we portray as "other" in this website are simply not as commonly fished for as the more popular fish. For insight into some of these "other" fish in Alaska, visit the other fishing page for more in-depth information. Best northern pike fishing in Alaska!